The Superfly pairs well any of our hammock models. 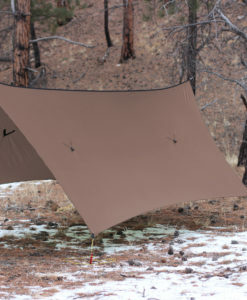 Great for cold weather use or folks who want one tarp for all conditions and seasons. The SF is our largest tarp. It would be considered a “Winter” tarp or an “All-Season” tarp. As far as size and coverage goes, it’s equivalent to the MJ plus removable door kit. The only difference is that the doors of the SF are not removable, rather they’re built-in to the shape of the tarp. (the more frequently you use doors the more you’ll appreciate the convenience of having them permanently attached, the removable door kits available on the other models are better for occasional door usage) The doors of the Superfly can be folded underneath when not needed, this creates a shape almost identical to that of the MJ (an elongated Hex shape…plus doors). The versatility, expansive coverage and convenient built-in doors make the Superfly a great tarp for any of our hammock models. This is our most popular tarp. It isn’t possible to say more than has already been said. Just look at the reviews, I’ve never seen a product with virtually 100% 5 stars, but after using this tarp for the first time I understand why it is so highly rated. Extremely fast delivery (about 5 days after order date!) unbelievably low price for the quality and design of what you’re getting. Insanely versatile, if you can only have one tarp or need one tarp for a long trip but handle any situation, this is the one. The little extras like the tube of seam seal and the 2 carabiners are nice too. I recommend the paracord mini buckle closure system for the doors, it is working great so far. If anything ever happens to my tarp (doubtful given it’s strength) I will immediately buy another one exactly like it. Customer service is the best in the industry. There’s a reason for all the 5 star reviews here. Look no further, you found the perfect tarp. My son and I both have this tarp. First time using it last spring in east TN, we woke up to a storm with 30 mph winds and small hail. The tarp stood up to the storm with no issues. I was a little concerned about he hail but the tarp shows no damage at all. I was very thankful for the attached doors. Barely could tell any wind was blowing except for the sound. I would recommend this to anyone looking to up grade or purchase a new tarp. Recently purchased this tarp for use with my XLC. I had the opportunity to use one an overnight trip to McAfee Knob. Conditions were 13* with moderate winds and sleet. Thanks to the built in doors I had no issues with drafts or the sleet. Was very great full for such a great product on a not so great night. The quality of construction is second to none. Would recommend to anyone looking for one tarp that can do it all. The superfly is an excellent shelter. I camped in the rain on first use and the superfly kept my gear and myself dry. The tarp dries quickly and is great in all configurations. 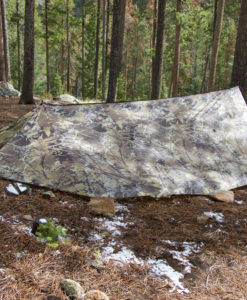 I would confidently recommend Warbonnet and this tarp. This is a fantastic tarp. I have the 20d silpoly and could not be happier. From the quality, coverage and weight; this has quickly become my favorite hammock. The pole mod is an excellent addition and changes the whole experience. I was in my Superfly one night on the AT during one of the worst thunderstorms I have ever camped in and stayed bone dry. I spent the night overlooking Lake Superior with a gorgeous view of Split Rock Lighthouse in March . . . in Minnesota. It was very warm for March but still got down to 39 degrees. The wind coming off the lake was a factor and I was really worried that I would freeze but once I got the Superfly up I crawled into the hammock and felt almost no breeze. The wind kept up all night but I slept like a baby. 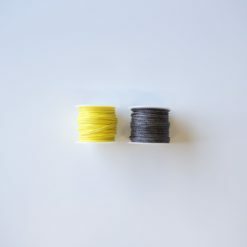 I’ve had my superfly for over 2 years, and used it with both the blackbird XLC and a ground-based setup (suspended my tent using the guy line to eliminate the need to carry poles). Either way the tarp works great. 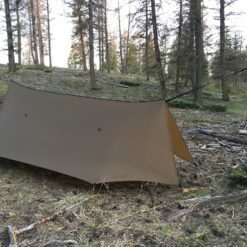 There are so many different config options with a tarp, wide open on hot days, a porch on the downwind side, or fully closed for maximum wind protection. There may be equivalent products out there, but I haven’t found anything that is higher quality than this tarp. Oh, and besides being all but bullet-proof, it also weighs next to nothing. I’ve been hiking/camping for over 30 years and never owned any product this awesome. If you’re thinking about a tarp, just buy this one right now, you will not regret it. Three years of all season use and this tarp is still my go to. Through wind, rain and snow this tarp gives you the protection and privacy of a tent without the weight. I am a pro at destroying nice things but my superfly remains unscathed, not even a loose thread or small tear to speak of! I can’t even think of one bad thing about this product it’s everything I need it to be. This fly is super! Seriously, this rain fly is fantastic. Lots of configuration, the material and craftsmanship is great, and tons of room with the optional tarp pole kit. Not to mention the response from the WB team is outstanding. 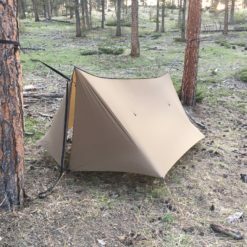 I’ve compared specs and price on several tarps. This can’t be beat for the value. I’ve also reached out to other vendors without being contacted. I feel very confident in recommending this tarp and the WB team. Happy hanging. 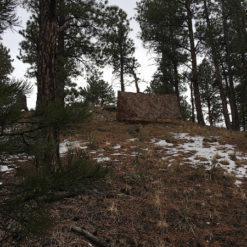 Yep…AT….on ridge due to brilliant camp restoration below (dummy). Thunderstorm all night. I wore my raingear in my hammock just knowing that the tarp would blow away. It didnt. My tie outs leaked because I didnt use a flowable silicon seal…but they just dripped and didnt get on me. I was dry all night my pack stayed dry under my hammock….I think I have put it through it s paces enough to trust that this is a great shelter. Love the doors for privacy and keep the wind off. I have put new sealant on and no more drips. Excellent tarp! Very roomy. Doors are great at keeping out the wind! Not a drip! I’ve had this tarp for the year and have waited to review it until I put it to some good use. First, build quality is excellent and it is quite packable for a large tarp. All stitching and attachment points are top notch. I’ve used it in mild Florida weather a few times and it performed perfectly ( I don’t like to camp in FL heat so no reviews on hot weather performance). I just returned from a trip to Canada where I used this as a gear tarp in Algonquin Provincial Park while canoe camping. The mornings were very misty and their was dew covering pretty much everything except for our gear under my Superfly! I ask used it for a night up near Tobermory on the Bruce Trail. Temp got down to 50 degrees and it was foggy and rained fairly hard. I was hanging above a tent platform and had to get creative to secure the tarp. It kept me dry, my gear, hammock, underlying dry, as well as a few feet of the platform so I could get dressed in the morning without soaking up water through my socks! Tarp dries out quickly in the sun, but I had to pack it up wet a few times and dry it out later during lunch. I’ll definitely be buying one of the smaller tarps for hotter and fair weather camping. Bought this last year before I went to Afghanistan. I was in the Kunar Province and it was rainy and cold a majority of the time. I never got wet once while under it and I was as warm as I could be given the circumstance. I would definitely recommend this product. The tarp seems like good quality, but for the price should come ready to use. My own fault, I made the assumption and used it during a heavy rain only to get drops of water thrown at me from the leaking pull outs in the middle (Which I don’t use). After returning to the site, I’m reading that the tarp needs to be sealed by the buyer. I would think $140 should pay for a couple strips of seam tape at the manufacturer. Instead, it’s recommended to glob silicone on my nice new tarp. So, I’m not terribly happy about that. Time to go to the hardware store and finish manufacturing this expensive tarp. Silicone-coated items cannot be “taped”, you must use silicone which takes 8+ hours to dry. We do not have the space to hang and dry a bunch of tarps everyday, and this is the reason that nobody’s silicone coated tarps come factory sealed with silicone either (only heavier PU-coated items can be waterproofed at the factory using “tape”). Some companies offer this as a service for an extra cost, we do not, however we are trying to source tiny tubes of silicone to include with the tarps. Any pure 100% silicone sealant/glue will work. I recently used the superfly over my hammock for a 9 day backcountry kayak fishing trip. It was exactly what I needed since it is super compact and light. We ended up getting some sever weather including some pretty intense thunderstorms and very high wind (over 70km) with rain non stop for two days straight. I was extremely worried as the tarp was in the open to the wind and taking a beating from the constant rain and extreme wind. Well, I cannot say enough good things, this tarp stood up to it all and begged for more! I stayed dry and the tarp did not rip! I am extremely impressed and would recommend the superfly to anyone and am thinking about getting a second one just to have a separate area to hang out away from the hammock. Thank you Warbonnet for producing such a top quality product! Used the Superfly last week for 5 days/4 nights on the AT in moderate to heavy rain. Had more than occasional misting and dripping under the tarp. Quality lower than expected, especially given the price. If it is actually misting that would certainly be covered under warranty, but the fact that you were on the AT in wet conditions leads me to think it was more likely condensation collecting on the underside of the tarp due to the humid, cool conditions and then getting knocked loose when the tarp is hit with raindrops, that and the fabric we have been getting lately has been really good waterproofness-wise. I purchased the superfly tarp and used it on kayaking trip during some periods of rain and I was very impressed with the material,craftsmanship, and the quality. 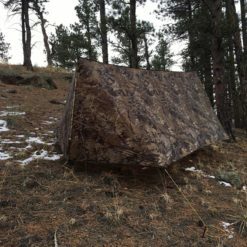 I have used it on several camping trips and I am constantly stopped by other campers and asked about the tarp and I’m excited to talk about the tarp and the time it took from order to receiving it. Great job and best wishes for you company. Warbonnet really outdid them selves on this one 5 stars for sure! I’m a fair weather camper, but sometimes choose poor campsites. One site I chose overlooking Blue Lake (Indian Heaven Wilderness) turned out to be at the narrow end of a geographic funnel where the wind concentrated, blowing mist and water off the evergreen needles above. Enter the Superfly. I had the door flaps in their most protected configuration. Not a drop of water, nor much wind either under the Superfly. I considered hunkering down for the day in the Superfly, but after 20 minutes, I packed up and walked down the trail. 200 yards later, I walked on dry trails and past campsites with no blowing mist. Really needed a tarp with doors for breezy winter camping and the superfly is perfect combo of lightweight and coverage. Made my other tarp obsolete. Great quality and customer service. Plenty of room for my 11ft hammock. Shipped in days. Just recommended to friend who also purchased one. Thanks! This tarp is the lightest thing since air. Setting up is easy and the coverage against the elements is amazing …. plus it add warmth as well. Customer service from the team at Warbonnet is beyond amazing and I am hard to please. Thank you! Look no farther for the ideal tarp for your Warbonnet Blackbird. I found the Superfly easy to use, easy to erect and I am confident it will serve me well. 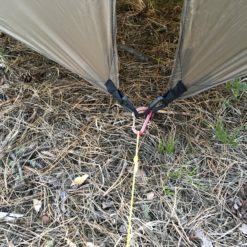 This is my first experience with lightweight hammock gear and it was easy to erect the Superfly following the excellent how to videos posted on the Warbonnet website. I was uncertain about the size of the Superfly thinking it might be too large for my needs but realize now it is a wise choice. Set up my new Blackbird with the Superfly Tarp for the first time. The Superfly Tarp is very roomy and gives excellent protection fro the weather. It was also quite easy to set up, even for a “rookie” to tarp/hammocks like me.I also like the option of leaving the front open and propped up on a couple of poles lean-to style. Quite pleasant to lie there in the Blackbird and be able to look out at the stars while still protected from the elements by the Superfly. Having purchased from Brandon in the past,the time came to look for a new tarp,this time one to be used in cold temps adding some doors to it;although i live in So Florida,a lot of our camping trips takes us to Central Fl during our winter season where it gets pretty chilly.This tarp,like all other products Brandon creates,is well built;from Stitching to Tieouts.It is very light and compactable;have it in a pair of snakeskins,which in turn is stored in the stuffsack it came with.Thank you Brandon. Summer or winter, no matter the season, this tarp goes with me. It’s ultra-light weight, so I don’t notice the weight in my back at all. You can’t beat the privacy, ease of set up, wind or rain protection this tarp provides. I put micro-carabiners on the ends (guylines) and color coordinated all my lines so set up is a breeze no matter how the weather is or if it’s completely dark. (My end guy lines are neon yellow, the corner lines are neon orange, and the middle lines are neon green.) This color system made it easy to identify immediately what part of the tarp I was pulling out of the compression sack so set up was instant. I can set this tarp up in under 3 minutes in the rain at night. I can’t recall the number of times our camping group has used this tarp to pack up gear in the rain or as a group shelter. It’s even great in the summer to provide a large area of shade. My camping mates are always amazed that I have my hammock and tarp set up before anyone else has their tents set up. Get this tarp! I am a hammock addict and have several of these for family members. All have been subjected to windy rainstorms (and occasional jumping puppy dog attacks) but have always kept things dry and held up with no problems. It is generously sized and stitching and construction is top notch, the same quality as found in the Warbonnet hammocks. This is my second review of the SuperFly. My first had to do with rain and this one is about rain and strong wind. While under another shelter, I kept shining my flashlight at my SuperFly with a sick feeling in my stomach that I may be sleeping tarpless due to the penetrating, forceful wind and rain. My SuperFly was stretched beyond recognition though I made sure it was anchored well. I did not have the luxury of trees blocking my exposure to winds off of Georgian Bay and was a bit worried I would be ordering another SuperFly upon return. However….the fly took ALL the abuse and looking at it now, you would never know the storm it absorbed. To make it even better, I enjoyed the rocking motion from the wind and the breeze blowing over….excellent sleep. Had the tarp given out, I would have been in a terrible situation. This tarp has protected me and my gear from high winds and torrential downpour that lasted for days. It’s big enough that I can set it up quick, get underneath with all my gear, and comfortably lounge while making dinner and changing. Big enough for two friends to join you. Packs up tiny. So many ways to set up. I love this thing! The pullouts must be seam sealed or a little water will get through in heavy rains. If you use the pullouts the water tends to stay off you, though. This tarp is awesome. The material is super lite and seems really strong. Its a lot bigger than I expected. If you are thinking of getting one of these stop thinking and just get it!!! You wont be disappointed. I am fairly new to hanging, and I bought the Superfly on the advice of others. I am very glad i did. Very easy to setup and great craftmanship. The first night i used it, there was a downpour most of the night. The fly performed flawlessly. I am very excited to use the Superfly all year round. I should have read the description over again when I wanted to buy this tarp, my bridge hammock has a distance of about 12’6″ between both descenders, and this tarp is only about 11′ long. but I really wanted the doors and thats what I was thinking about. I love this tarp because of all the space created with the tie outs, and the stitching job was very good. love the flat dark earth color! I love this tarp. I was going to buy the multicam for better rain protection but there was really no need. I set up and this light-weight fly endured 24 hrs of solid rain and thunderstorms. The only that got wet was my ridgeline due to wicking..no fault of the tarp. The porch mode with trekking poles was fantastic, large, and easily accommodated 2 people in chairs comfortably. The cam colour worked very well in the environment I was in. The quality is excellent and I have no concerns of losing a tie-out or ring. 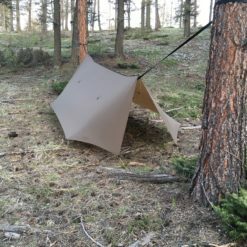 I used cpverne’s no-sew short pole mod with this tarp with great success. Just got back from the Superfly’s first trip to a mountain lake with my wife. We were able to find two tree’s close enough to both share the Superfly and stay dry despite the rain. My knees enjoy the lite weight and the workmanship is top rate. This will be my go-to tarp….summer and winter. This tarp is perfect. Bought it originally for my hammock and now I will use it for tarp camping as well. It held up to very high gust of winds in porch mode. Great fly. Set up is quick , closes up quickly for those sudden summer thunder showers. Set up my new Superfly to attach guylines and practice. Workmanship is top notch and found it quite easy to get a tight pitch without much effort or fiddling. Very pleased with my purchase. I purchased two Superfly Tarps for a section hike through the Shenandoah in April. The rain was consistent and at times unrelenting. My daughter and I used the tarps with modified Hennessy Hammocks and they performed wonderfully. The tarps kept the blow back out, afforded the privacy we wanted when huts/shelters were a bit crowded and setup/takedown was a breeze. We kept the tarps in snakeskins and would towel off moisture prior to packing up. The weight hardly noticeable as it is part of our shelter which came in about 8 oz beneath the tent set ups we had used in the past. Love the product, many of the thru hikers we met were intrigued and mentioned switching to a hammock given the added features (door, weight, easy setup) and benefits the Superfly provides. This is our go to tarp system! I was hesitant on bying this tarp because of cost and would I really need a tarp this big with doors. If you are going to spend anytime out in bad weather you cannot go wrong with this product. As soon as I recieved mine I set it up in the woods and slept under it for three days with lots of rain and not a drop on me or the gear. I’ve been backpacking and camping for a number of years, and have gone through my fair share of pieces of gear. Some good, some great, some lacking. This tarp does what I wanted it to, gracefully. It’s put together well, hangs easily, and the fabric is nice and silky. It’s also huge, in a good way. Tie offs are well buttressed and I’ve no doubt that they will last. It’s nice and big, and I like the doors a lot. Nice touch with the tie-offs on top to use it w/o doors if they aren’t desired. I’d buy it again, and I’ll be recommending it to friends looking for a hammock tarp. This fly is huge, with full coverage on all sides, and stops those chilly under-breezes. Well made, light and compact. Everything I’m looking for in my backpacking gear. My order was handled very quickly. Thanks, Brandon! Like so many poor dejected lost souls I tried to make a $30 cheap PU tarp work for a year before accepting the inevitable and buying my Superfly. Why ohh why did I wait! I have reinforced seams, resealed stitching, added structural ridgelines and spent entirely too much of my time working on an inferior tarp when I should have simply bought the Superfly from the start. After several uses over my Blackbird this Superfly far exceeds my expectations. Stitching is flawless, tie outs provide many options in open porch (my favorite) or hunker down mode. Mid tarp tie outs provide a very nice way to create room under the center and prevent noisy flapping. Packs nicely whether you choose to stuff sack it or make your own snakeskins (recommended). I have nothing negative to say for this product and can only shake my head in wonder that I didn’t buy it while upgrading my hammock a year earlier. Save yourself the trouble, you know you’re going to buy it eventually! Just returned from a four day trip to the Red Rive Gorge in Kentucky and I have to say the Superfly Tarp is a great piece of equipment. I used it with both sides staked to the ground, tent style and with one side pitched, porch style….and I much prefer this setup. Grab a couple of tree limbs, stake it properly and you have a wonderfully useful area to get out of the sun and rain. It was particularly nice to sit in my BlackBird XLC under the “porch” and drink my coffee as the sun came up each morning. Bottom line the Superfly is a well made, versatile and easy to use piece of equipment that packs away to nothing in my backpack. Well done WarBonnet! I hang in 4 seasons both in the mountains and desert. 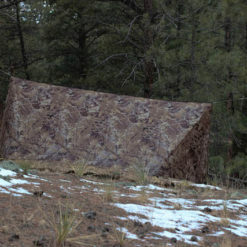 Needed a tarp that took care of me in any weather condition as wind and storms come on so fast here in the Rockies. First weekend I got pummeled in a rainstorm. It kept me perfectly dry. Packs small. Very light for its size. LOVE IT!! I have to admit, this is my first hammock tarp. I am however, a fairly seasoned backpacker, but had previously used a big agnes tent. 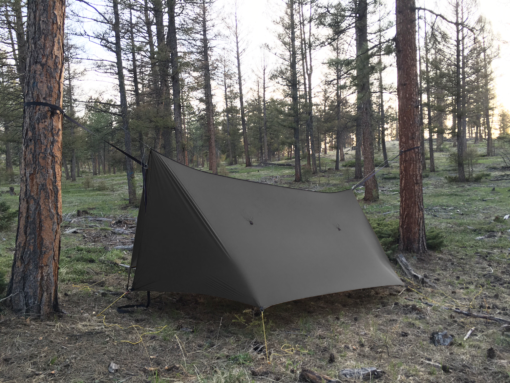 This thing provides great coverage, especially when compared to something like an all in one solution like the Hennessy Asym, or some of the ENO tarps. The tie out tabs on the sides of the tarp are great for additional head room, but I found that unless I made the angle of the tarp shallow, I didn’t have to have them. I found the weight nice as well for the coverage, it’s probably only a couple of ounces more for a lot of protection. The other aspect of this experience that was fantastic was the customer service. I asked for some extras before making the purchase, and they delivered well above my expectations or requirements. Great product, and great overall experience. Brandon and his products are top notch with customer service second to none. I used the tarp this past weekend, high wind and rain, and had no issues. I’ve also purchased the WB BB a few months ago, I can’t say enough good things about his product line. Next on my list is the underquilt and top quilt, looking forward to reviewing those in the near future! This is my second Super Fly purchase. My first was 3-4 years ago in silnylon. I love this tarp and have used it many times without trouble. It’s never leaked and have never failed me. It still looks like new. I live in the cold North, so a full size tarp that I can close up while in my hammock is a must. In my continued quest for everything Multicam. I purchased the Super Fly in Multicam to complete my stealth hammock system as I like to hang in areas where sometimes I really should not be. At first I was put off by the weight of the the Multicam fabric, but it’s really the only choice is you want to use this camo pattern and have rain, snow and sleet protection. I was surprised that when I received the Superfly that is was as compact as it was in this material. It’s heavier then the silnylon version, but the stuffed size is not bad. Smaller then my UQ when stuffed. Hat’s off to Brandon for making the Super Fly in Multicam. 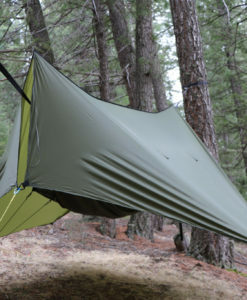 I’ve seen countless recommendations for this tarp on Hammock Forums, and decided to go for it. Every bit as good as advertised. I love the built-in doors and tie-outs. It gives you a lot of variety in your set-up. And the price is much better than others of comparable size and material. I’m a happy camper. Grate tarp, best quality for your money for this size tarp with panned pulls and doors. Awesome product! Set this up for the first time last weekend and it was a breeze. Tarp is put together well. Completely covers the hammock. Packs small and is pretty light weight. It’s a great tarp if it’s your only tarp. This is the perfect all around tarp. Yes it is bigger and heavier than some fairer weather options, but if you had to have one, this would be it. It is tough, the design is phenomenal, and it is like a palace under there. It obviously shines in bad weather, and all of my friends express their jealousy over my tarp and comfort level because of this tarp when the weather gets foul. It also packs up smaller than you could imagine when putting it back into the stuff sack. So much tarp in such a small package. I’ll likely get one of Warbonnets smaller options for this summer, but I would never give up my Superfly! The extra weight is worth it for the multi-tasking this tarp does. We had a surprise wind advisory added to a rainstorm we already planned for. Tying the doors shut with a cord kept the heat inside and the wind outside and kept the hammock from rocking through the night. During the day, it doubled as a dressing area for our group who wanted to change out of wet clothes. Folks in the group who wanted to hang items they didn’t want to get wet under their own tarps (due to the wind blowing the rain inside their doorless tarps) used my tarp. You’ll love the rings strategically placed on the corners for adding line or shock cord. (HINT HINT: it would be nice if very small pockets were added to each corner so this cord/line could be tucked in at each corner when taking the tarp down. It would be a tidier folding process.) This tarp became the topic of conversation over the trip, and Warbonnet will likely get several orders from them in the next few weeks. I’m glad I did my research and bought this tarp! I’ve not had a chance to use this, but I have set it up and I am looking forward to using it. Excellent craftsmanship. Exactly as specified. This is a follow up of sorts to an earlier review… the first one being some great comments about the company and the service. Now that I’ve had my SuperFly on the AT for a weekend, I can say it was a great purchase. Lightweight, easy to set up/take down. Overnight the temps dropped into the mid-upper teens with a steady wind. My new SuperFly kept me cozy. LOVE the doors. Great design, quality workmanship. Based on a fellow “hanger’s” suggestion I am going to use shock cord on the doors to keep them closed. I spent an evening before we left just setting up the tarp, adding ropes, etc. (none are included). It was time well spent getting familiar with this great system. 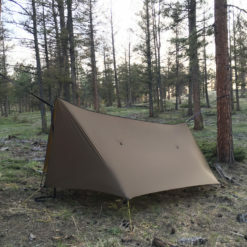 Currently my set up utilizes the loops on the ends of the built in ridgeline (saves cord and weight) but I may go “old school and return to a continuous ridgeline under the tarp. This tarp and my WBBB double are a great setup. Thanks again to Brandon and his crew. FYI: I spent way too much time and money trying other tarps to “save” money. The smart thing to do is invest in this tarp ASAP and you are set. Excellent all around!! More than plenty of tarp than I could ask for!! Work like a champ!! Even in pretty hefty wind. If you’re looking for a superior tarp with all the bells and whistles without the fuss, Superfly is the way to go!! I ordered two Super Fly Tarps for an upcoming six week hike on the AT with my daughter. We don’t mind getting wet – just don’t want to stay that way. We live on the Gulf Coast and were able to get a feel for it in very windy conditions. These are stealth Tarps! Completely able to block wind and rain, keeping our gear and ourselves dry. We set up for a couple of days in the rain and wind and other than silly things I did, everything remained dry and we were very comfortable when we “closed the doors”. It is clear a lot of thought went into this tarp to keep the hardware smooth and functional. No easy to break plastic or oversized and heavy hardware. I’m happy! Looking forward to putting it to use in the mountains soon. Not too heavy, not too light – just right!! The quality of Warbonnet products are second to none. I own two BB and a SF tarp – so far ;). Not my only hammocks/tarp but definitely my favorites and the best. Product quality is matched by service that is just as great. When my scouts (or parents/other campers) ask about the best product/company, my answer is quick and confident: Warbonnet Outdoors. This tarp is as awesome as it looks! You can’t go wrong with this piece of gear. From the weight, to ease of setup the superfly is everything it is cracked up to be. Highly recommended! ! I took my Superfly on an Appalachian Trail section hike this weekend and it was great. The last night we camped on Blue Mtn with 30+ mph winds and this tarp performed perfect. I ask a question on Hammock forums titled ” If you could have only one tarp” and it was a huge majority vote for the Superfly so that’s I made my purchase. I’m glad I did because it’s seems to be as close to the perfect tarp as I could get. Thanks Warbonnet for great products. Recieved my Superfly tarp just in time before a hike / hang in the Appalachians. It worked flawlessly on a mid teens blowing night. I’ve used my Blackbird hammock for a couple years now with a smaller tarp. But the Superfly has so many more options. The big comfortable size using the side pullout option gave tons of room. The built in doors make a huge difference on being able to hunker down out of the wind in winter or rain. I can easily see the Superfly making a light but very generous sized tarp tent. The quality of workmanship is A+. 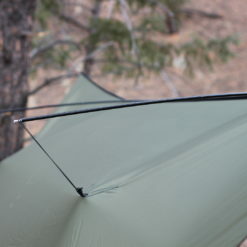 But the total flexabilty of uses for the Superfly make it the perfect tarp in my opinion. Thank you! I purchased a new Superfly (and Blackbird) for my Grandson’s birthday. We got to try them both out at the Colorado Mt. Evans Winter Hang Feb 14 -16th. We ended up with lots of snow flurry/blizzards and wind. When it wasn’t blowing it was blowing even harder! Gusts were in the 40 to 50 mph range. The Superfly performed perfectly, with the edges pitched nearly to the snowline, with some snow banks to the outside. I have one of the older models with the detachable doors, and there is far less “fiddle factor” with the new model that has the doors integral with the tarp. The fact that the doors don’t detach for lighter weight is of no concern to me, as I have a different, lighter, smaller summer weight tarp for the warmer season. The only thing I miss is the little ring in the middle of the ridgeline that is so handy for clipping the doors back to when not in use. Shouldn’t be too hard to use the tie-out loops though. 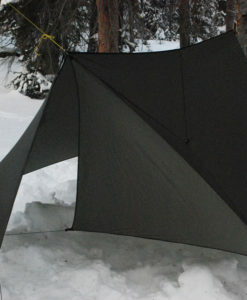 Excellent winter tarp, or for any use where the weather is less than beautiful! Works fine all year around though, if a person is not of the ultra-light variety! I like the size I can change it up. I can put it is storm mode.batten down. I have 4 – 36′ aluminum poles so I can raise both side up if it is just mild rain and the crew can hang out under it. This tarp is amazing. The versatility and affordability of this all weather tarp cannot be overstated. It is spacious and thoroughly thought out to provide the best protection from the elements for you and your gear that you can find anywhere especially at the price point. Multiple tie outs allow for various setup option including sneaking in a second hammocker under it. If my life was on the line this would be the item I would want to have. it is also a Bonus dealing with Brandon. He puts the time and effort into all his products to assure you will be nothing less than completely satisfied.